Labor Thanksgiving Day is a national holiday in Japan which takes place annually on November 23. The law establishing the holiday cites it as an occasion for commemorating labor and production and giving one another thanks. 勤労感謝の日きんろうかんしゃのひ・Labor Thanksgiving Day, is held every year on the 23rd of １１月じゅういちがつ・November and can trace its roots back to a harvest festival that occurred as early as 660BC. Traditionally, the hard work of the 農民のうみん・farmer and farm laborers would be celebrated and the success of the 収穫しゅうかく・harvest would be dedicated to the gods by the Emperor himself. After the ceremony many people would sample the newly harvested 米こめ・rice for the first time. Modern Day 勤労感謝の日きんろうかんしゃのひ・Labor Thanksgiving Day was established in 1948 after the promulgation of the post-War constitution and celebrates the establishment of fundamental human rights, expanded rights for workers, commemorating the hard work of laborers and giving thanks to one another for the hard work people do, and giving thanks for the fruits of those labors. 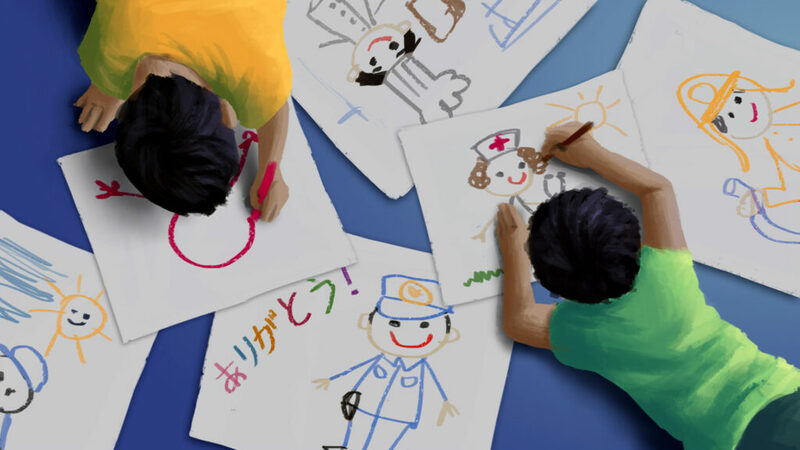 Many 小学生しょうがくせい・elementary school students draw pictures or create other simple forms of art that they then give to local 警察けいさつ・police offices and fire departments to say “thank you,” to the people that protect society.